Are you the King or Queen of tomorrow? Do you have lists that just keep getting longer & a work schedule that's straight up running you into the ground? Are most of your personal projects on hold because they're too big to tackle? Is your social life a mess? (jks is nonexistent & your friends are starting to worry). Are you finding it hard to move & grow within your own space and self? If you said yes to any or all of these then never fear, your organisational care package is here! I've spent many minutes, hours, days....okay weeks thinking about all the things I need to do. I had the motivation but I didn't have the means. Truth be told, If you went through my report cards at school you would find the same one-liner... "Has a lot of potential, but needs to concentrate/apply herself." Growing up, I didn't know how to overcome these statements. With looming school deadlines, extracurricular activities taking my attention all over the place, part-time work from the age of 15 & the simple fact that I was trying to figure out this crazy thing we called adolescence, you can see the makings of a recipe for disaster. A LOT of wasted time, bad prioritising & late night stressing had me feeling like Stacie Orrico; (There's gotta be) More to life. But through all these wasted moments I've found a few foolproof ways to get my life in order (Its only taken me the entirety of my secondary tertiary education to perfect them). A little nip & tuck here & a few new habits there & you have the foundations to a pragmatic & (dare I say?) productive life. Yadda yadda yadda here it is. The space in which you are trying to conduct your business/study/personal life should be in optimal condition for you to complete your tasks & live. There is no point in sitting down to study only to find that you have to fight to find room between last nights leftovers, some super glue covered fabric (last nights DIY) & some irrelevant but might come in handy misc. objects. Pretty much what I'm saying is; get in the space that's the right fit for the work you're about to do. You've got the perfect space you say? Awesome! But its full of stuff? What...You think you have a hoarding problem? YIKES! I HEAR YOU! Hoarding stuff can be a real bummer & it doesn't just affect you. I've nipped this problem right in the bud with one set of guidelines. Whether its clothes, books, documents or just miscellaneous objects, this method works every single time. Even the simplest habits can help you avoid backtracking, bide you some extra time & save a lot of unnecessary stress. Use your phone calendar to set reminders for deadlines, events, meetings etc. 1 week & 24 hours in advance. Plan your journey, pack your bag & lay out your clothes. Know 5 recipes like the back of your hand. Last minute dinner decisions just got easier. When grocery shopping think ahead to avoid unnecessary spending later. Buy a bunch of tupperware & go HAM on meal prep. It can take as little as 1 hour, once a week. This is not just for gym junkies! It's one thing to coordinate your own life, it's another to organise a gaggle of people. Its hard to make headway when your calendars clash, emails fall into overloaded inboxes & that ever-pesky "seen" message is a straight up lie. Meetings are fun & all, but scribbles of lists in obscure places are the remnants of what you thought was a constructive & productive time with your peers. In reality, all you're left with is a big project with a deadline & a heck of a lot of work to do. But what if there was an easy way to communicate, unpack, keep track of a project & see real-time progress? Well, there is & its called Trello. I was recommended this online tool by a friend after talking about bullet journalling ( I'll get into that soon). I personally haven't used this application but I took the time to explore its features enough to share with you! Also its free & takes two seconds to sign up! Essentially, you can control who has access to a board (project). A board contains tasks (to do). WIthin those tasks, you can write a description, upload media, links & comment. You can move tasks to the "doing" pile & finally into the "done" pile. Super simple & I can see this being an uber-effective tool for uni students (dreaded group assignments), business projects & even for your personal life. This also takes out the awkward social media alternative. Facebook can be useful but also very distracting. Plus, with Trello (and other applications like it) you don't have to compromise your privacy & professionalism. Starting a bullet journal was the best thing I could have done during my university degree. To put it simply, a bullet journal is a highly adaptive system for sorting & prioritising aspects (or all) of your life. 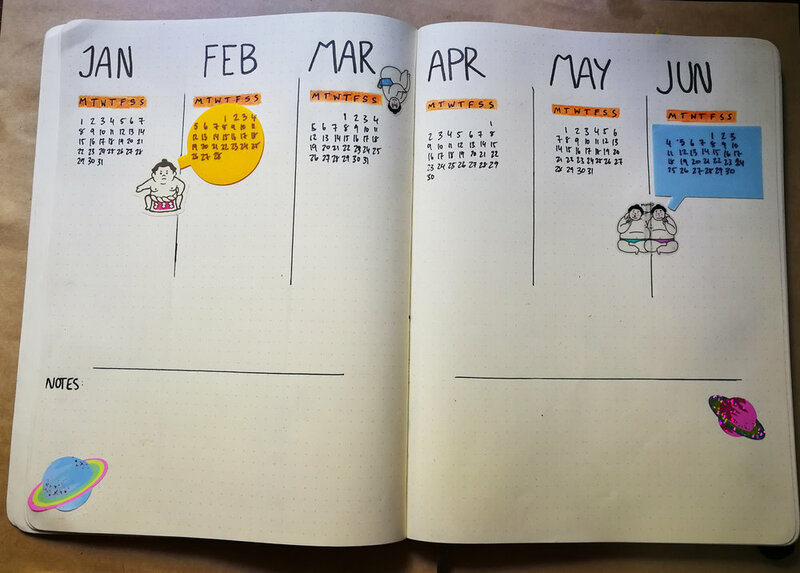 Unlike most stock standard calendar diaries, the format and layout of your bullet journal can change day to day, week to week, month to month. It is a system that allows you to grow & expand with ease. If you were to search "Bullet journal" you would receive about 59 million hits. Most of these examples are highly decorative & very Pinterest worthy, mine however, was not. I used the skeleton of the system & was very minimal. I didn't need to be distracted more by illustrating in a journal for the purpose of productivity. To explain the workings of a bullet journal I have used blank templates & pages from my 2016 bullet journal. This is the future log. Like most standard diaries there is an overview of the current year & sometimes the first 6 months of the next year. In this section, you jot down any important dates like birthdays, public holidays, events, time off etc. It is a log for you to reference. This is your monthly spread. Think of it as your cover page for what you are about to do for the next 31 days. Refer back to your future log for any key dates like birthdays, events etc. and write them in here. Bullet journaling is very open ended& highly customisable. In your monthly log you can write down anything you want to achieve, any tasks that need doing, habits you want to form or just general notes. This is one of my monthly spreads for 2016. It was centered mostly around university (as that took up the majority of my life & needed the most organising!). These are little signifiers, who doesn't love a signifier? They are useful tools for streamlining your lists. EVENT: Birthdays, holidays, appointments, parties etc. TICK: You've completed a task! MAIL: Call someone, make an appointment, send an email etc. For example: On Monday you write down that you want to go to the gym at 5:30PM. On Monday you don't go to the gym, so you forward arrow that task. On Tuesday you also flake out on going to the gym. This process repeats until Thursday. With all these forward arrows in your weekly spread, you can see a trend of not going to the gym at 5:30. Maybe you need to address why that is? Is it because you're tired? Work late? No motivation? Whatever it is you can see in writing that something is being pushed back every day. You can begin to see where your priorities lie because they are contextualised within your entire schedule. The solution to the problem might just be that you need to go to the gym in the morning. Thus you change your habits in order for your productivity to increase. This is a weekly spread. On this page you transfer all your key dates in your monthly spread to the week. Then you write down anything you want to get done. Some people have analog trackers, to monitor their goals & habits. 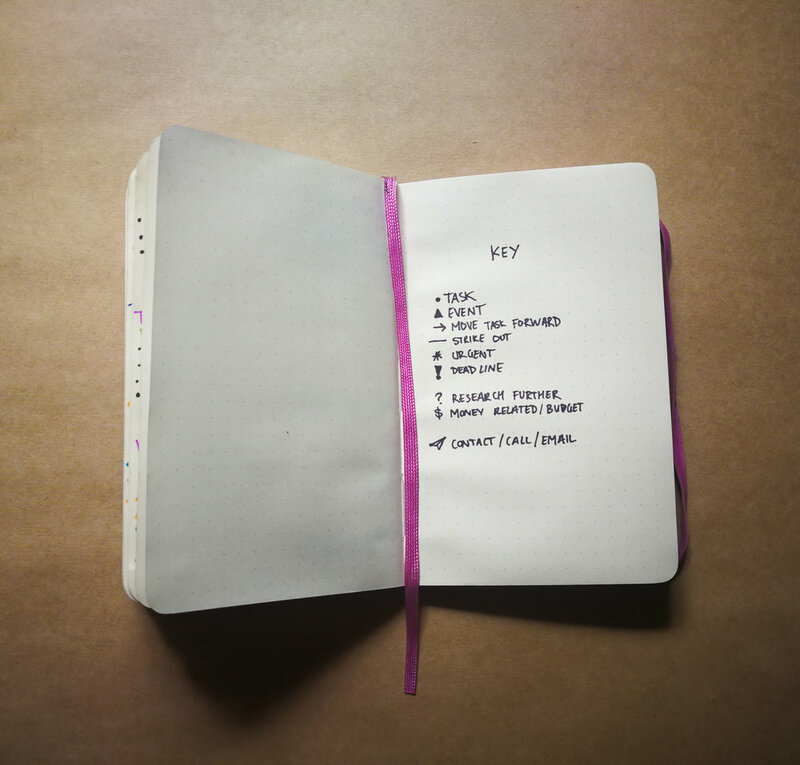 When writing your weekly spread you use the keys to help organise your lists of tasks more efficiently. Here is a weekly spread from one month in 2016. I re wrote this example because my actual weekly spread looks like hyroglyphics. When using my bullet journal I found myself being motivated to get tasks done. I was finding time to chip away at my goals & stay ahead of stress. I noticed trends & habits more easily & I was able to problem solve issues with time management & productivity. Essentially, bullet journaling helped me micromanage ( not always a bad thing) my own life. I was able to break down big projects into manageable stepping stones, spread over many days or even weeks. The best thing about bullet journaling is its tailored to suit your lifestyle & your needs because you are its creator. For those of you, who find having your schedule on an electronic device/app hard to manage/access/edit, then this system is right for you. Like the official bullet journal website says; it's "The analog system for a digital age." Through organisation, I have found my overall productivity increased. On top of that, I realised that the by-product of productivity is motivation.